Building on the success of the industry-standard ARRI Compact Fresnels, the new D5, D12, D25 and D40 have over 30 new improvements. With reduced weight, compact size and maximum light output, the TRUE BLUE Daylight series sets a new standard for professional lighting equipment. Pressure die cast and extruded aluminium components have reduced the overall weight of the TRUE BLUE fixtures without any sacrifice in quality or durability. Many components now offer greater strength and resistance to corrosion. ARRI’s cross cooling system* reduces both lamp housing temperature and lens temperature, enabling the lamp-heads to be operated at even a 90° tilt angle. Special air channels built into the aluminium extrusion direct a constant stream of air around the Fresnel lens and into the lamp-head, even when the light is pointing directly up or downwards. At the heart of the TRUE BLUE concept is a redesigned stirrup and improved tilt lock. The stainless steel friction disc locks the lamp-head securely, even when heavy accessories such as large Chimeras are in use. To make balancing the lamp-head even easier, the sliding stirrup mounting can be adjusted to counterbalance these front-mounted accessories. The new extruded aluminium stirrup is stronger, lighter and less bulky, but still permits full fixture rotation; its soft contour also makes the lamp-head more comfortable to carry. Improved barn-doors are stronger and less susceptible to bending, with a new hinge design that maintains constant, easily adjusted tension. Routine maintenance and repair are easier with fast, simple access to all internal components: the complete igniter, for example, can be changed within ten minutes. Cleaning a TRUE BLUE lamp-head is rendered an effortless task by its smooth lamp housing surfaces. ARRI has redesigned these new lamp-heads down to the smallest detail, offering lighting professionals better choices for location and studio work. ARRI’s cross cooling* system moves a stream of air around the Fresnel lens and through the lamp-head. In addition, air is channelled through the aluminium extrusion housing, reducing lens and housing temperatures. Cross cooling* allows ARRI TRUE BLUES to safely operate at almost any tilt angle. TRUE BLUE fixtures have been designed for serviceability with more common parts across the line. Removing a maximum of six universal Torx screws provides easy access to all interior parts. TRUE BLUES require only three Torx drivers to disassemble the complete fixture. ARRI’s new aluminium extrusion makes cleaning fixtures easy and our new paint process ensures that TRUE BLUES will look as great as they perform. Finally an easy solution to an old problem. Location crews need space in the accessory bracket for up to four scrims; studio crews suffer from the light leak this creates. Now two-position TRUE BLUE accessory brackets quickly adjust in or out for two or four scrims. By reducing the space between the scrims and the lens, unwanted reflected and spill light is minimised. Although the top latch holds accessories securely at any tilt angle, both Studio and Location lamp-heads feature a second safety catch mounted on the bottom accessory bracket. This eliminates the need for a barn-door safety bond without restricting the rotation. Modern fixtures use a wide variety of Chimeras, scrollers and other front mounted accessories. Simply slide ARRI’s innovative stirrup bracket to quickly and easily adjust the fixture’s centre of gravity. Easy to carry, ARRI’s new aluminium extrusion stirrup is smooth, incredibly strong and extremely lightweight. ARRI’s new design creates a positive lock so there’s no slippage when using heavy accessories. A stainless steel friction disc functions like a disc brake allowing the lamp-head to be completely locked off with a minimum of force. The laser cut hexagonal safety mesh maximises light transmission and is tough enough to withstand location abuse. The Location Top Latch is specially coated for improved corrosion resistance and is spring loaded for fast operation even when hot. TRUE BLUE fixtures are manufactured to the IP23 standard and are suitable for indoor use or outdoor use providing a degree of protection against falling rain (up to a 60 angle from vertical). New ARRI barn-doors use a special alloy with a high strength-to-weight ratio. The leaves in our new design withstand bending and deforming far better than traditional barn-doors. In addition, leaves are now easily tightened to avoid slipping and the larger leaf design provides better control and sharper cutoff. The same features are incorporated in a new optional eight leaf barn-door. All True Blue fixtures carry not only CE declaration but also an independently assessed TUV certification. 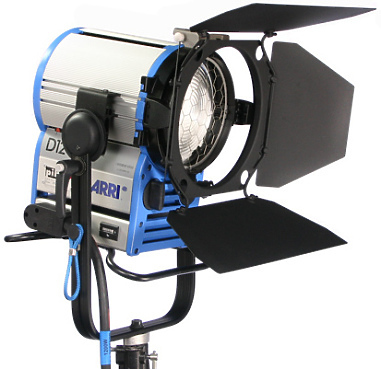 Hire the ARRI D12 HMI Light from Procam. Best service and rental rates for the ARRI D12 HMI Light and all cameras, lenses, sound, lighting and grip.